Americans Frances Arnold and George P Smith will share the prize with Briton Gregory Winter, who is based at Cambridge University. This year's winners used a technique called directed evolution to create new proteins. These have been used in areas as diverse as the manufacture of new drugs and green fuels. Frances Arnold, from Caltech in Pasadena, was first to use a method mimicking natural selection in order to develop enzymes that would perform specific tasks. Enzymes are biological catalysts - which speed up chemical reactions in biological cells. Prof Arnold's directed evolution techniques are now routinely used to develop new enzymes. George P Smith and Sir Gregory Winter developed a technique called phage display to evolve new proteins. They used bacteriophages, viruses that infect bacteria, to generate new antibodies - large proteins that are used by the immune system to neutralise harmful bacteria and viruses. The first antibody based on this method, adalimumab, was approved in 2002 and is used to treat rheumatoid arthritis, psoriasis and inflammatory bowel diseases. Since then, phage display has produced antibodies that can neutralise toxins, counteract autoimmune diseases and treat metastatic cancer. Prof Dame Carol Robinson, president of the Royal Society of Chemistry, said that directed evolution of enzymes and antibodies "are now transforming medicine. It would have been hard to predict the outcome of this research at the start - this speaks to the need for basic research". 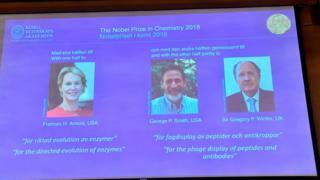 Frances Arnold is the fifth woman to win a Nobel Prize in Chemistry; the last female winner was Ada Yonath from Israel, who shared the 2009 award for discoveries in the structure and function of the ribosome - a minute particle involved in the synthesis of proteins in the body. On Tuesday, Donna Strickland became only the third female winner of the physics prize, and the first woman to win it in 55 years. Arnold will take one half of the nine million Swedish kronor (£770,686; $998,618) prize, while Smith and Winter will share the other half.